Nearly two decades ago they were the new punks on the block, taking Pop-Punk to a whole new level. The Southern Californian three piece have sold close to 35 million records, becoming popular around the world after initially appealing to the skating and surf crowd. Blink-182 were originally called Blink but had to add the numbers after being threatened with a lawsuit by an Irish band of the same name. The band are Mark Hoppus, who sings and plays bass, Tom DeLonge, who plays guitar and sings, plus drummer Travis Barker, who replaced original drummer Scott Raynor in 1998. Their first two albums, Buddha (1994) and Cheshire Cat (1994) came out on Indie labels and did much to build a strong following. 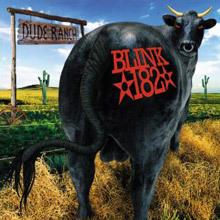 In 1997 they released Dude Ranch and it became their first album to chart in America. Two years later Enema of the State, which featured the singles What's My Age Again?, All the Small Things and Adam's Song went top 10 in the American album charts, as did their live album, The Mark, Tom and Travis Show (The Enema Strikes Back) the following year. Enema of the State made the UK Top 20, while All The Small things made No.2 on the UK singles chart, four places higher than it did in the USA. 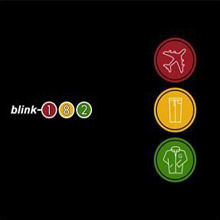 It was Take Off Your Pants and Jacket in 2001 which took them to No.1 in America, No.4 in Britain, and two years later they were back with their equally strong self-titled album. There followed something of a hiatus, with the band all taking time off to do their own things. It was only after Barker was involved in a horrific plane crash in 2008, in which he was very badly burned and four people were killed, that the band got back together again. Their 2011 album, Neighborhoods made it seem like they'd never been away as it went to No.2 in the US, and topped the UK Rock chart as well as making it to 6 on the main album chart. The new-school punk trio Blink-182 were formed in the suburbs of San Diego, California around guitarist/vocalist Tom DeLonge, bassist/vocalist Mark Hoppus, and drummer Scott Raynor. Originally known as simply Blink, the band debuted in 1993 with a self-released EP, Fly Swatter. After releasing the album Buddha in 1994, the trio signed to Grilled Cheese/Cargo and released Cheshire Cat the following year. The threat of a lawsuit from a similarly named Irish band forced them to change their name to Blink-182, but the group earned a higher profile touring the world with Pennywise and NOFX on the 1996-1997 Warped Tour, as well as appearing on innumerable skate/surf/snowboarding videos. new member into the trio's ranks; Travis Barker, formerly with the Aquabats, settled in on drums after Raynor left midway through a 1998 U.S. tour. Enema was greeted with almost immediate success, and helped the band achieve the mainstream status of toilet-humored pop-punk kings that Dude Ranch had only hinted at. Driven by the commercially successful singles "What's My Age Again?," "All the Small Things," and "Adam's Song," music videos for the three songs (whose clips included themes of streaking and boy band spoofs) were MTV smashes as well. After selling over four million copies of Enema of the State, the trio played on with the limited-edition release The Mark, Tom, and Travis Show (The Enema Strikes Back) in fall 2000. The album featured their radio hits in a live setting, intertwined with their quirky sense of humour as well as the new song "Man Overboard." Take Off Your Pants and Jacket, issued in spring 2001, saw the band return to its SoCal punk rock roots. Maturity, of a sort, came with 2003's self-titled album, released on Geffen. Not only did the album sport a song ("All of This") that featured Robert Smith of The Cure, but "I Miss You" also topped the modern rock charts in 2005. In February 2005, however, popular as ever and seemingly indestructible, Blink-182 unexpectedly announced they would be going on an "indefinite hiatus," supposedly to spend more time with their growing families. Asking fans for help in selecting tracks, the group issued Greatest Hits that November. The band members also continued on with other projects. Barker -- who had previously released an album with DeLonge as Boxcar Racer -- continued playing with the Transplants and running his clothing company, Famous Stars and Straps. His family was also spotlighted in the MTV reality show Meet the Barkers. Hoppus carried on with his Atticus fashion venture, began producing -- starting with Motion City Soundtrack's Commit This to Memory -- and hosting his own podcasts. He further began work with Barker in a new band, +44. DeLonge also continued work with his lifestyle clothing company, Macbeth, and formally announced his new project, Angels and Airwaves, that fall. In 2009, blink-182 announced that they were reuniting and would be getting back to work on new material as well as touring again, hitting the road with Weezer for their reunion tour. They went into the studio later that year and began laying down the groundwork for a new album, which would be plagued by delays until 2011, when they were eventually able to release their sixth studio album, Neighborhoods. By this, their third album, Blink-182 had settled into their groove, one that has been described as 'juvenile, adrenaline-fueled punk-pop.' It's very much a reflection of their age, the culture, the lifestyle and humour enjoyed by both the band and their fans. It’s also an album that is full of great hooks and is the album the points the way towards where they are headed. 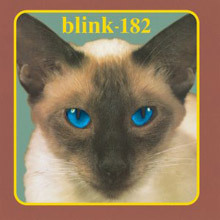 For their major label debut Blink-182 did not mess with the formula, , ,and why should they? The success of "Dammit (Growing Up)," the first single from their third album, Dude Ranch, had brought them a wider audience and after they signed to MCA they set about creating what is for many their finest album. It’s full of great, catchy tunes like, "Going Away to College," and throughout the album they show that they have a just the right handle on what makes a great pop-punk song. There comes a time in every punk's life where he or she has to grow up, or at least acknowledge that maturity is just around the corner. blink-182 put it off for as long as they could, but ten years into their career and two albums after their big breakthrough, 1999's Enema of the State, they decided to make a stab at being grown-ups for their eponymous sixth studio album. 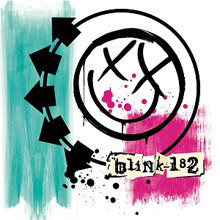 As with many self-titled albums, the trio uses this as an attempt to redefine itself, and they have considerably expanded both their sonic template and lyrical outlook on blink-182. Not too much has changed since we last left blink-182. You might hear the same snap, crackle, and pop that the trio has prided themselves on for almost ten years. There's even the continual cabbage-patch screech of Tom Delonge and support for rampant teen angst. But five albums later, these San Diego natives grab their rosy-cheek punkadelics and add a bit more of a flamboyant, passionate maturation on Take off Your Pants and Jacket. When Enema of the State leaped onto the charts in 1999, the lyrical direction was 90 percent party-boy mentality, leaving little room for traces of a growth spurt. And while we're still feeling the continual back-drip of tracks from Enema, the fresh plethora of tunes from these rambunctious Toys-R-Us rockers have more purpose than ever. With a fight-for-your-right joviality that's often irresistible, songs like "Anthem Part 2" and "Stay Together for the Kids" house a indomitable school-kid voice where a surging vapor of knockout speed chords meet wrecking-ball percussion. Neighborhoods is the bands reunion album released in 2011, eight years after their self titled album from 2003. This self produced album shows the band to have matured from their pop-punk earlier albums, which is inevitable given their ages ad all that had happened to them. Some bands attempt to hang onto their youth way too long and as a result sound insincere and sometimes plain stupid. 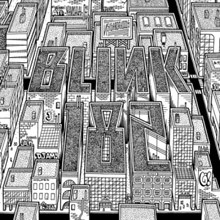 Not so Blink-192 who by choosing to move on musically have delivered an album that is more prog-punk than pop-punk. The lead singles from the album that went to No.2 on the US album charts were, Up All Night and After Midnight. This, their 1994 debut album, is definitely one for the fans. It is stuffed full of their juvenile fat-punk tunes and shows clearly the direction that they will take as they become one of America’s most dynamic young bands. The standout tracks are M+M's and Wasting Time that were both released as singles to promote the album, and picked up a great deal of radio play. 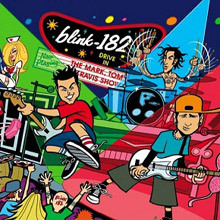 This live album followed hotly on the heels of Blink-182’s major-label debut, 1999's Enema of the State, The Mark, Tom and Travis Show showcases their full on fun filled live shows and encapsulates all that made the band so popular as the perfect antidote to bands that took themselves way too seriously – much to the delight of their audiences and their fans. It does exactly what it says on the cover. 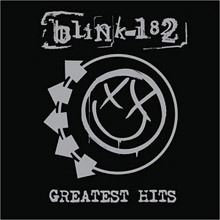 It is a greatest hits collection that spans the bands career from their first album in 1994 up until 2005. It includes, Dammit, their first big hit, from Dude Ranch and one of their earliest catchy songs. From 1999's Enema of the State, there’s All the Small Things and there’s also Josie, What's My Age Again?, The Rock Show, and Stay Together for the Kids among the 17 tracks on the album. There’s also a cover of the Only Ones', Another Girl Another Planet. You will not feel short changed either as a fan or a newcomer to San Diego’s finest.